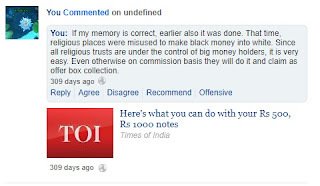 This is what I have posted in Times of India regarding Note cancellation: "If my memory is correct, earlier also it was done. That time, religious places were misused to make black money into white. Since all religious trusts are under the control of big money holders, it is very easy. Even otherwise on commission basis they will do it and claim as offer box collection. Whether the issue of 500 & 1000 Note cancellation was leaked is another concern. For more information on black money, read my book "A FRAUD IN THE INDIAN CONSTITUTION"